Mumbai, April 15 (IANS) Tiger Shroff has already started shooting for his debut film "Heropanti" with routine scenes but will soon go into heavy duty dancing and then what he loves the best - the action sequences. "Of course, action is my forte. But to me, all my scenes are equally important. The dancing, fighting, emoting...I have to give my best all through the film. 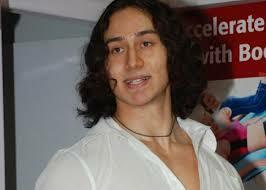 I won't get this opportunity again," said Tiger who idolises his father Jackie Shroff. He is trying to imbibe the same silent intensity that his dad did in "Hero". Apparently Tiger's "Uttar Pradesh ka bhaiyya" character in "Heropanti" doesn't speak much. He simply...well, smoulders. And when he speaks Tiger's Mumbai upbringing is never allowed to come forward. Tiger has not only trained in the martial arts and other ways of the warrior, he has also been taking speech lessons so that he sounds like a rustic guy from Uttar Pradesh. "Now, I know what my dad went through for the past 35 years. It's no joke to face the camera and do everything that a screen hero does without looking unnatural. Hats off to all the actors, technicians, directors and cameramen for their hard work. I am just starting out," said the youngster. The schedules for "Heropanti", which is being directed by Sabir Khan, are gruelling. "For the past few days I've shot non-stop from 5.30 am inwards till late night. I don't even have time to touch base with my parents. It's hard but great fun. I couldn't have hoped for a better launch and a better producer than Mr. Sajid Nadiadwala," he said.